Kerry is definitely up there with being one of the most beautiful places in the world (we may be quite biased). Kerry has everything to offer – beaches, mountains, rivers, lakes, bogs, woods you name it! So if you are visiting, here are some of the things that are a must see. The Wild Atlantic Way, which snakes along the Irish Atlantic coast, is the longest coastal route in the world. 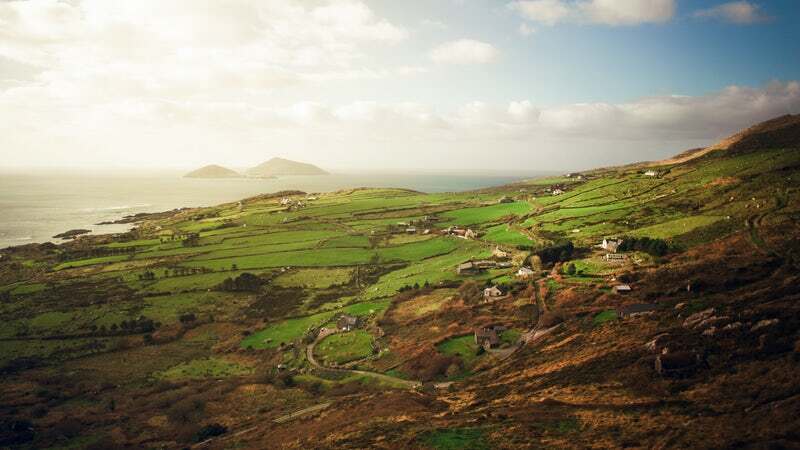 A signature discovery point on the Wild Atlantic Way, Bray Head on Valentia’s south west coast opens up unspoilt views of the Skellig Islands, Blaskets and the mammoth Kerry Cliffs. Perched on top of it is the 1815 Watch Tower. The views are absolutely breathtaking and definitely worth the travels. Skellig Boat Trip – do you love the taking the water? The magnificent Skellig Islands lie 8 miles (12 km) off the coast of Portmagee in South West Kerry. Rising majestically from the sea, Skellig Michael towers 714ft. (218 metres) above sea level. On the summit of this awe-inspiring rock you will find a remarkably well preserved sixth century monastic settlement. On the spectacular Small Skelligs 23,000 pairs of gannet nest on every available ledge making it the second largest gannet colony in the world. A visit to this major tourist attraction may well be the highlight of your holiday. Valentia’s Skellig Experience showcases the story of the UNESCO world heritage site offshore. 3D models display the Christian monastery founded in the sixth century, and explain how monks survived with very limited resources in such remote settings and the many Viking invasions they endured. Lighthouse keepers and their families lived on Skellig Michael too, until the lighthouses became automatic in 1981. Stay in an Irish castle If you’re happy to visit a castle then you can stop off at somewhere like the historic Ross Castle just outside of Killarney, but if you actually want to sleep the night in one you only one choice but boy is it a good one. Obviously we are a Major attraction for any tourists visiting Kerry!! We have a vast array of gifts, clothing, jewelry, everything that you can think of! You are sure to find the perfect Irish gift for your loved one with us. After visiting, bring home a piece of Kerry from Skellig Gift Store. Killarney National Park is one of the most beautiful tourist attractions in Ireland and by far one of the top things to do in Kerry. There are lots of ways to get around, depending on the weather and how adventurous you’re feeling. You can walk, hike or drive or you can pay to have a jaunting car (horse & carriage) take you around the park. A boat trip on the lake can also be arranged. Trust us, you will not be disappointed. The Top of the Rock Viewing Platform is situated in the townland of Kimego, over the water , Cahersiveen. It is approximately 3kms form the town of Cahersiveen. This small town land is unique in that it is home to majestic Ballycarberry Castle, and three Ring Forts dating back to 600AD. On the farm itself there is a Standing Stone and a Cillín ( Children’s Burial Ground ). From the summit you have an aerial view of the layout of these prehistoric structures and their proximity to each other. To reach the Platform you have a 550metre trail, with a gradual incline, which is suitable for all ages. There are picnic benches along the way suitable for breaks for the adults as the children explore the trail for the magical fairy houses that are to be discovered. The historical sights to be seen from the summit include, Daniel O’Connell Memorial Church, RIC Barricks, Valentia Observatory, Church Island, Look out Tower in Beginish Island, Glanleam House, Valentia Slate Quarry, Valentia Cable Station, Sliabh Each Briquette Factory and The Great Blasket Islands. The views from the Platform are quite simply stunning and to be able to sit on a sunny evening and watch the sun set over the Great Blasket Islands is an experience not to be missed.